VACCINES: What CDC Documents and Science Reveal uncovers shocking and inescapable truths: Vaccinations can cause disease and can be linked to chronic illnesses, including the entire spectrum of developmental, learning and behavioral disorders now epidemic in our children. This video intelligently and concisely justifies the concerns and objections of a rapidly-growing number of people related to the dangers of modern vaccines. What's more, it does this using established medical literature. Information contained in this video will spare adults from further vaccine-induced injuries and spare innocent children from a lifetime of mental, physical and immunological limitations. This lively, 111-minute studio presentation is for everyone who is considering vaccination, who has been vaccinated, or those who want solid scientific justification for choosing not to vaccinate. Board certified in Emergency Medicine and highly esteemed by her peers in Alternative Medicine, Dr. Sherri Tenpenny began an intensive investigation to uncover the truths about vaccines after attending the National Vaccine Information Center's annual conference in September 2000. Her quest involved an extensive review of documents from the Centers for Disease Control, the World Health Organization, and the research published in the world's most respected medical and scientific journals. "Dr. Sherri Tenpenny has excellent insight and a unique ability organize and present material regarding the very complex picture of vaccine safety." "Dr. Tenpenny is a gifted educator. Her search for honesty is refreshing. 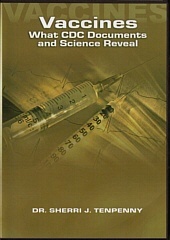 This DVD is one that all parents facing the vaccination question need to watch." "Dr. Sherri Tenpenny's reputation as a leading expert on vaccine issues is well-deserved. This presentation contains truths you absolutely need to hear to protect your health and the health of your loved ones." There is a great deal of controversy about the safety of vaccines in the past few years. Why? Frankly, because the public portrayal of vaccine safety is vastly different from the medical literature. This video shows you what you need to know. Being in the medical field, you are well aware of the raging controversy about vaccine safety that currently exists. This video will provide the information you need to understand the "other" side of the constroversy directly from peer-reviewed medial literature. Lives may be saved as a result of your viewing this video. Your customers will appreciate the hard-hitting scientific information that you provide them by showing this video at a home meeting. Why not then allow customers to "check it out" for a few days to show it to their friends and family. An informed customer is your best customer.